Johannesburg has been taking the lead when it comes to going green. Following the recent listing of South Africa’s first Green Bond, the city has been involved in a number of environmental and sustainability projects and this time around boasts a first for Africa with the EcoMobility Festival 2015. The Festival, which has been said to have left a legacy for Johannesburg and the international climate community, was a month‐long experiment of an eco‐mobile urban transport system. The Festival allowed commuters to leave their cars at home and encouraged the use of public transport, cycling and walking. Through various events and dialogues, the Festival allowed citizens to reclaim street space and provided a platform for mobility experts, local government leaders and private sector representatives to discuss sustainable urban transport solutions for the future. The Festival further reinforced the belief that roads have more than one purpose. According to an official release by the City, “[Roads] are being built for more than private vehicle use only, but are also the most common public spaces for walking, cycling, public transport, meeting people, and so on. The EcoMobility Festival strives to present a glimpse of the future, enabling residents, visitors and organisations to experience what a future, congestion-free precinct will look and feel like. As such, access to certain demarcated roads will be limited for private vehicles, encouraging public transport usage. To ensure that disruptions are limited, a comprehensive traffic management plan has been developed. The organisers of the EcoMobility Festival 2015 celebrated its success as the event came to close. 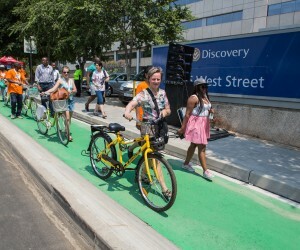 Hundreds of mobility experts and local government leaders attended the EcoMobility Dialogues, while Johannesburg citizens took part in the many events that reclaimed the streets of Sandton for people. Sporting events, bike rides, education programs, concerts and a family day transformed the streets of the financial district of Johannesburg into a lively and fun place for four weeks. Citizens and visitors also had the opportunity to test up to 70 eco-mobile vehicles at the Exhibition and test track arranged at the Festival area. “One of the objectives of the Festival was to encourage citizens to change their behavior and transport choices, by leaving their cars at home and use alternative modes of transport, such as public buses and trains, bikes and light electric vehicles, or car sharing and car‐pooling options. The City of Johannesburg reported a significant increase in the use of public transport and a decrease in private vehicle use accordingly. A quarter of all respondents to a survey used the high speed Gautrain to move in and out of the city, a figure that almost doubled compared to before the Festival. Walking and cycling also increased significantly,” according to the City. On West Street, the central axis of Sandton turned into an e-comobile boulevard, the number of pedestrians increased five times, with almost 2500 pedestrians walking on West Street during peak hours. By giving priority to walking and cycling on streets and public spaces, it was shown that walking is safe, comfortable, beneficial to health and it allows to engage with one another and with the environment. "The EcoMobility Festival was never about achieving miraculous achievements overnight, but to point out compelling global reasons and ways for citizens to contribute to decongestion in our urban course" said Mpho Parks Tau, Executive Mayor of Johannesburg. 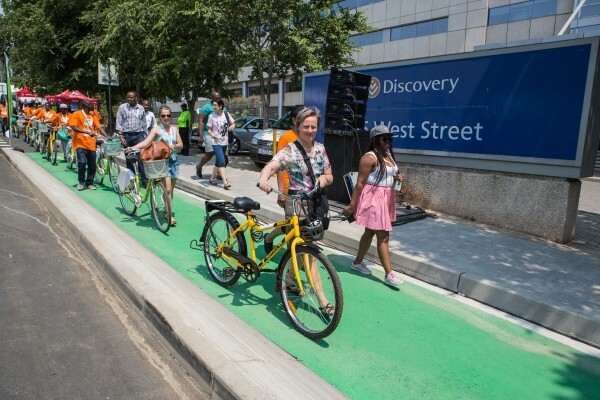 Building on the already impressive transformations in the urban design of Sandton CBD (more dedicated bike lanes, refurbished and widened sidewalks, upgrading of public spaces), the Mayoral Committee has approved further projects based on the experience of the Festival and feedback from residents. As part of the “Corridors of Freedom” project, a new pedestrian bridge will be constructed between the low‐income township of Alexandra and Sandton, which will make walking and cycling safer and more convenient. The Rea Vaya, Johannesburg’s successful BRT system, will be extended, linking major residential neighborhoods like Alexandra, Diepsloot and Ivory Park with Sandton and the Johannesburg CBD. In the Sandton CBD, a permanent public transportation loop, further bike lanes and bike parking will come soon. The implementation of permanent Park&Ride spots in the vicinity of Sandton is envisaged, and priority lanes for public transport will be made permanent from the beginning of 2016. According to Tau, "The City has officially begun reclaiming its streets to resolve Johannesburg's congestion and greenhouse gas emissions concerns that are increasingly threatening both our environment and the economic health of our city". The Johannesburg Declaration on Ecomobility in Cities, prepared by ICLEI and the City of Johannesburg and endorsed by city leaders and experts from five continents, emphasises that no greenhouse gas emissions reduction strategy is complete without the inclusion of low carbon urban transport solutions. Endorsers of the Declaration have called on all spheres of government to actively commit to their share in enabling the transition to a low carbon mobility future. Endorsers also request national delegates to the UN Climate Conference in Paris, COP21, to recognise local and subnational governments as relevant implementers of the climate deal. The transport sector is today responsible for 23% of global CO2 emissions and accounts for 27% of global energy consumption. "It is worrying to know that emissions from urban transport are growing worldwide", said Monika Zimmermann, Deputy Secretary General of ICLEI—Local Governments for Sustainability. “Changing transport policies and patterns is crucial to win the climate battle and keep us under the 2°C threshold. Cities and regions are at the forefront of this transition”. Tau, will bring the Declaration to COP21 in December 2015, conveying the message that urban transport is a key element in addressing climate change and cities are prepared to do their part.